Pictured in this file photo is the Delaware Entrepreneurial Center at Ohio Wesleyan University prior to the building undergoing renovations. The renovated facility, located at 70 S. Sandusky St., Delaware, will open Oct. 4, with a community reception and celebration at 4:15 p.m. The center is a collaboration of the university, Delaware County and City of Delaware. 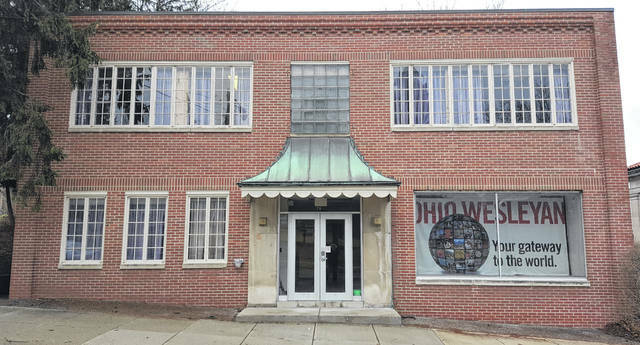 The Delaware Entrepreneurial Center at Ohio Wesleyan University will open officially Oct. 4 with an afternoon ribbon-cutting, remarks and public tours. The celebration will continue that evening with the 2018 Robert L. Milligan Leaders in Business Lecture. The newly renovated 6,000-square-foot entrepreneurial center is a collaboration of Ohio Wesleyan, Delaware County and the City of Delaware. It is the first-of-its-kind liberal arts business accelerator and the first-of-its-kind city, county and educational institute partnership. The ribbon-cutting will take place at 4:15 p.m. Oct. 4 at the facility, 70 S. Sandusky St., Delaware. Afterward, guests will be invited to enjoy refreshments as they explore the center’s rentable office spaces, shared work area, conference center, and other amenities designed to help entrepreneurs transform ideas into marketable products. All who lease space at the center will receive assistance from Ohio Wesleyan student-interns. The interns are able to help with everything from conducting market research and creating business plans to designing logos and building e-commerce-focused websites. One of the center’s inaugural clients also is an OWU student himself. Freshman Jack Foley this spring launched ReYuze Cases, a company that creates and sells cellphone cases made of plastic recycled from the streets, canals, and landfills of Haiti. A portion of the proceeds supports Haitian children and families who collect and recycle the plastic for their economic stability and well-being. The product also is intended to help remove plastic from oceans, lakes and rivers. The Gaithersburg, Maryland, resident said he hopes to utilize the expertise of his fellow students and other resources available at The Delaware Entrepreneurial Center to take his business to the next level. Following the ribbon-cutting and open house, Ohio Wesleyan invites the community to return to the university at 7:30 p.m. on Oct 4. for the annual Milligan Business Ethics Lecture. This year, Shadman Zafar, Citi’s global consumer technology head for digital, will discuss “Rules of Engagement: Guide for succeeding in Corporate America.” Zafar will speak in the Benes Rooms of Hamilton-Williams Campus Center, 40 Rowland Ave., Delaware. He is a 1994 Ohio Wesleyan graduate, earning his bachelor’s degree in mathematics and computer science. Zafar joined Citi in 2017. Citi is the world’s leading global bank, handling approximately 200 million customer accounts and conducting business in more than 160 countries and jurisdictions. He previously worked for JPMorgan Chase, Barclays Bank, and Verizon Communications. Zafar is active in technology research groups nationally and internationally, and has researched neural networks as well as the sociological impacts of emerging technology trends on contemporary society. Created in 1992, Ohio Wesleyan’s Milligan Leaders in Business Lecture Series is organized by The Woltemade Center for Economics, Business and Entrepreneurship. The series was created with an endowment gift from Robert L. “Bill” Milligan, OWU Class of 1922, and his wife, Mary Cook Milligan, an honorary 2002 OWU alumna, both deceased. Learn more about the Milligan Lecture and The Woltemade Center at www.owu.edu/woltemade. Learn more about The Delaware Entrepreneurial Center at Ohio Wesleyan University, its unique city-county-university collaboration, and its opportunities for up-and-coming entrepreneurs at www.owu.edu/delaware-entrepreneurial-center.